Dental veneers are the most common and practical method for restoring and revitalizing your smile, but oftentimes the process of installing them can be painful and detrimental to the overall structure of your healthy teeth. Fortunately, our friends at Cerinate® have developed ultra-thin, ultra-durable Lumineers® that transform your smile without the need for shots, reshaping sensitive tooth structures, or pain! These custom-designed pieces are easy and quick to install so you can get that beautiful smile you’ve always dreamed of in a fraction of the time! Proven to last for over 20 years, there’s no better solution on the market today for repairing chipped, crooked, discolored, stained, or unevenly spaced teeth. Stained teeth that cannot be improved with whitening. The Lumineers® process can be completed in just two visits. During the initial consultation, impressions of the upper and lower jaw as well as photos of the mouth will be taken by a specialist. The molds and photos are then sent to a Lumineer lab where custom veneers will be made to ensure the best care for you. 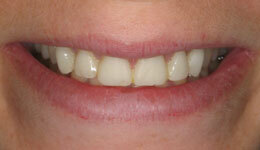 Once the veneers are manufactured, they will be inserted during the second visit to restore your smile. Before placing them, a proper evaluation will be made to ensure they fit correctly and comfortably on the tooth’s surface. Lumineers® and dental veneers are very similar in that they both are bonded to the front of a tooth to resolve issues such as chipped, stained, or gapped teeth. However, there are key differences between the two options. 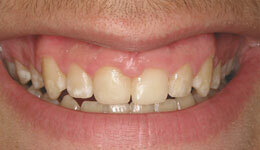 The main difference is the tooth preparation involved while placing them. With dental veneers, it is required to remove a thin layer of the tooth’s surface because the veneers are slightly thicker than Lumineers®. 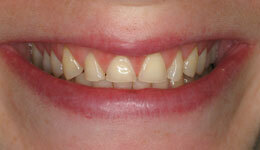 Lumineers® are less invasive and do not require any preparation and are simply placed into place. This helps preserve the natural tooth entirely. Lumineers® are also made completely out of ceramic, which is a much thinner material that can eliminate the need for injections or drilling. They produce a natural looking restoration and are aesthetically pleasing. The ceramic material used to fabricate the Lumineers® are stainless. You can enjoy all of your favorite food or drinks without having to worry about staining. The procedure is completely reversible. Because no grinding of the natural tooth structure is required you can easily remove the veneers and return to your natural tooth structure. They are extremely durable and long-lasting. At Rockefeller Cosmetic Dentistry, our staff cares about treating our patients as painlessly as possible. 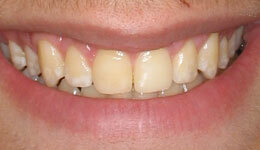 In as little as two visits, we’ll restore your smile to its stunning glory. Call (212) 581-1091 or visit our consultation request page. Don’t wait another day to start smiling again!